Incredible to watch. 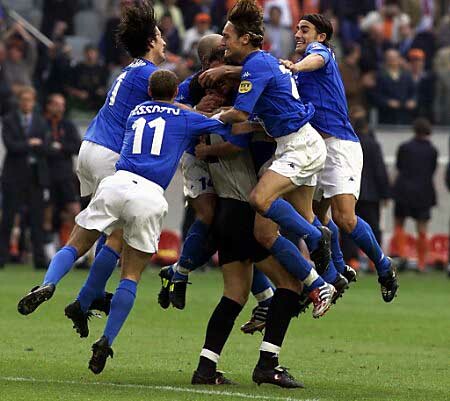 On June 29, 2000 Italy took on the Netherlands in a semi-final match of Euro2000. The men in orange were expected to win, and a devastating 6-1 win over Yugoslavia in their quarter-final portended the worst for Italy. Italy had had a successful tournament leading up to the semi-final, defeating Turkey, Belgium, Sweden, and Romania on their way to Amsterdam. The performances of Stefano Fiore, Filippo Inzaghi, and Francesco Totti (who was only twenty-three at the time) emboldened the Azzurri against the Dutch. Yet it was Italy's defence that would steal the show in Amsterdam. Italy were facing a catastrophe in only the first half after Gianluca Zambrotta was sent off in the 33rd minute for a second bookable offence. All signs pointed to a Netherlands win, but Fabio Cannavaro, Alessandro Nesta, and goalkeeper Francesco Toldo put on a show that I will never forget. Toldo saved Frank De Boer's penalty in the 38th minute, and Cannavaro and Nesta ensured that Dennis Bergkamp and Patrik Kluivert were kept quiet the entire game. After De Boer, Kluivert missed a second Dutch penalty, but the Netherlands continued their unremitting onslaught. Somehow, Italy clung on and took the game to penalties, during which Toldo saved two--one again from De Boer and one from Paul Bosvelt. Jaap Stam blasted his penalty into oblivion, and Kluivert was the only Dutch player to score from the spot. For Italy, Luigi Di Biagio, Gianluca Pessotto and Totti scored, and Maldini missed what was to be an inconsequential penalty in the end. It was an Italian win that some would find prosaic and totally fortuitous. For a fan of calcio, however, it was a cerebral display of tactical mastery. Cannavaro and Nesta were simply unbeatable, and while the Netherlands continued their vain search for a goal, the duo slowly deprived the game of space and chances. It was the ability of Toldo, Nesta and Cannavaro to stay undaunted in front of a partisan crowd which really stood out. Before the game, Dutch legend Johann Cruyff had said Italy could not beat the Netherlands, but the Netherlands could lose to Italy. However, to look at that game solely as Dutch suicide is to detract from Italy's ability to cope with the situation far more intelligently than their opponents. Yet, the indignation at the Italian win was widespread. For example, the BBC described Marco Delvecchio's near-goal in extra-time as a potential "travesty." And this was in just a regular match-report. Leading up to the tournament, Italy were not fancied to go far. They were without key players as striker Christian Vieri could not travel because of a thigh injury, and first-choice goalkeeper Gianluigi Buffon broke his arm a week before the tournament. Coach Dino Zoff was a lugubrious figure throughout Euro2000, and even his side's largely unexpected win in the semi-final did not visibly elate the man. "Let's wait until the final," he responded to a journalist when he was asked to smile after the game. Of course, Italy would lose the final heartbreakingly to France, but that game in Amsterdam is my most cherished memory of Euro2000.